Your father has been so buried under railroad business that he forgot he had so little time before your birthday—though he didn't by any means forget the birthday, as he spoke about it a week ago. 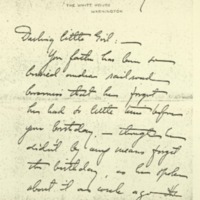 He has asked me to send you the enclosed check with his and Edith's dear love and loving wishes for a happy birthday—as happy as it can be without Frank.Dr. Grayson was at Elberonor on the way there, when Dr. Schauffler decided that Nell had typhoid, so he went right to her at Spring Lake. He swears—and this time he I believe he is telling the truth—that both he and Dr. S. consider the case a light one, and as Miss Harkins and Miss Puckey (the fine little nurse who with Miss H. took care of Nell when Ellen came) are to with her, I know she will be well nursed; and I know enough about typhoid to feel that's the chief thing. Dr. G. for once told the truth to the patient, so she knows she must be careful. She is in good spirits, he says, so conditions are as good as possible. Dr. G. says we may all write to her—cheery letters will be good for her. She's at Spring Lake. Bones, Helen Woodrow, “Helen Woodrow Bones to Jessie Woodrow Wilson Sayre,” 1916 August 27, WWP17539, Jessie Wilson Sayre Correspondence, Woodrow Wilson Presidential Library & Museum, Staunton, Virginia.